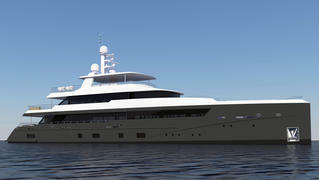 The largest yacht to be built in Brazil to date is taking shape at the Riostar yard. Currently known as the Riostar 160, the 45.3 metre yacht features naval architecture by Donald L. Blount as well as interior and exterior styling by Fernando De Almeida. 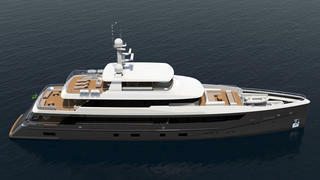 The yard adds that the full displacement hull is being made from aluminium and assembly of the first blocks has begun. Meanwhile the composite superstructure will support four teak decks and the entire project could be complete before the end of 2019. Accommodation is for up to ten guests split across five cabins, including an owner’s cabin, two doubles and two twins, while the crew quarters provides accommodation for up to nine. Power will come from a pair of 1,300hp Caterpillar C32 ACERT engines for a top speed of 15 knots and a maximum cruising range of 4,000 nautical miles at 12 knots thanks to a total fuel capacity of 87,250 litres. As these preliminary images show, the upper deck will feature a shaded spa pool and dining area, while the foredeck will be fitted with a large seating area adjacent to the main tender storage space. When complete, the Riostar 160 will be the fifth superyacht from the Rio de Janeiro-based yard, which has previously launched the 33.8 metre Papa Golfe and the 36.58 metre Aroma, as well as Bejoa II and Cisne, which are sisterships in the 39.37 metre Riostar 130 series.